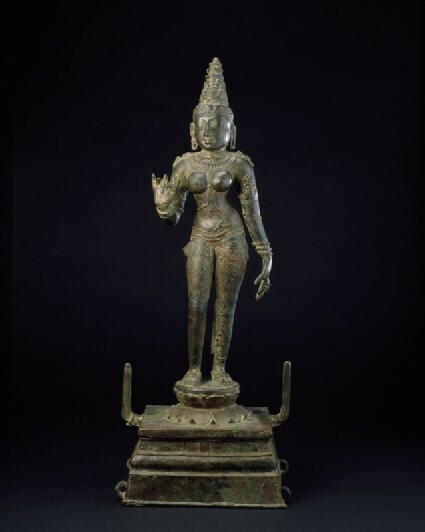 South Indian bronze images of the Chola period (9th-10th centuries) are among the most graceful and accomplished achievements of Indian sculpture. They were installed in temples and occasionally carried in ceremonial processions. This image, probably of Parvati (Uma), would have accompanied one of her consort, Shiva. The goddess stands with her weight resting on her left leg, her right leg slightly flexed. Her right hand makes the gesture called Kataka hasta, within which a flower bud or bloom was sometimes held. Some similar figures actually hold one made of bronze. This is the pose of all the images of feminine deities which accompany statues of Shiva or Vishnu, often one on either side with one as a mirror image of the other. As with all Chola bronzes, this figure is not inscribed. The sensitivity of modelling emphasizes the extreme youth and even fragility of the goddess, and the face is modelled in an impressionistic way. It is dated purely on stylistic grounds to mid 10th century as by the end of the century, a stylisation of the faces and hardening of modelling had set in. Purchased with the assistance of the Art Fund and the MLA/V&A Purchase Grant Fund, 1987.